There could be several gangs involved in the theft of cash machines in Northern Ireland, the police have said. Det Ch Insp David Henderson said eight ATMs had been stolen in seven separate incidents in 2019, along with one attempted theft. "We are actively looking at it being several gangs involved," he said. 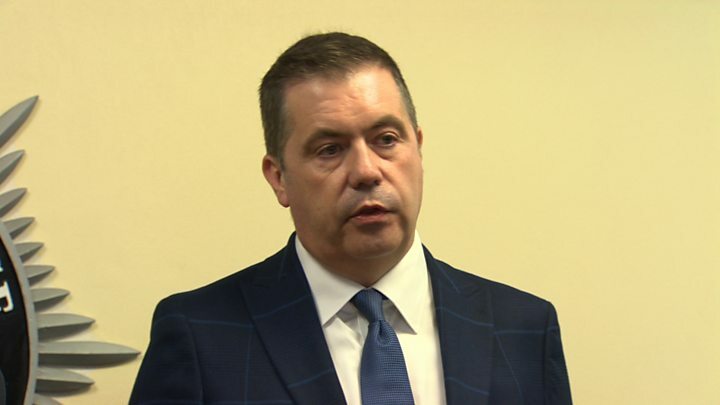 He said there was no evidence paramilitaries were involved, but added that they may be taking "some of the criminal assets". Det Ch Insp Henderson made the comments following the latest theft, when a cash machine was stolen from outside a shop in County Antrim. 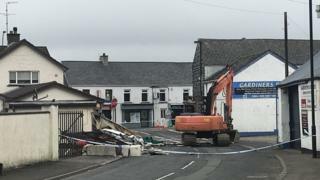 A digger, which had been stolen from a nearby site, was used in the raid at the Nisa shop on Brook Street in Ahoghill. The incident happened in the early hours of Monday, and police said considerable damage was caused to the building. Shop owner Walter Millar said the machine "will certainly be missed" by the community but there was now a "fear" about replacing it after the theft. Monday marks 30 years of Mr Millar being involved in the business. He initially thought a call about the theft was an April Fool's prank. "From what I can tell, they've used a digger that they've taken from a building site down the road, ripped the machine out, used a people carrier with the roof cut off to get the cash machine into it and then drove away," he said. "The wall of the kitchen at the back of the shop has been ripped out and there's a fair amount of damage to be done, but we won't know the extent of the damage until we get inside. "It's been a difficult time, given the current economic climate, and things like this doesn't help at all." Det Insp Richard Thornton said the initial call at 03:25 BST was about a digger on fire in the village. "I want to appeal to anyone who was in the area around the time the incident and saw what happened, including anyone who saw a silver-coloured people-carrier type vehicle to call us," he said. Image caption Walter Millar said it was "not what I expected to wake up to"
Last month, the PSNI announced the creation of a new team of detectives to investigate cash machine thefts, following an upsurge in the number of built-in ATMs being ripped from the walls of commercial properties by plant machinery. A DUP delegation, including party leader Arlene Foster, met Assistant Chief Constable Barbara Gray and the PSNI ATM taskforce on Monday. "The loss of ATMs across Northern Ireland has been a devastating blow for many rural areas and particularly for the businesses who have seen such destruction of their premises," said Mrs Foster. Retailers have expressed concerns the attacks could force them to withdraw the service.